Battery Park City, New York, U.S.
Leonardo Wilhelm DiCaprio (born November 11, 1974 in Los Angeles, California) is an American actor, movie director, movie producer and writer. Some of the movies he has appeared in include What's Eating Gilbert Grape, Romeo + Juliet, Titanic, The Man in the Iron Mask, The Beach, Catch Me if You Can, Gangs of New York, The Aviator, and The Revenant. His first movie was Critters 3. In 2016, DiCaprio won his first Academy Award for Best Actor for his portrayal of Hugh Glass in The Revenant. DiCaprio was born in Los Angeles, California to George DiCaprio and Irmelin DiCaprio. His father is of Italian and German and His mother is of German and Russian descent. 1995 The Quick and The Dead Fee Herod "The Kid"
2002 Catch Me If You Can Frank William Abagnale Jr.
2004 The Aviator Howard Hughes Nominated for Best Actor at 2005 Academy Awards; won a Golden Globe. for What's Eating Gilbert Grape? 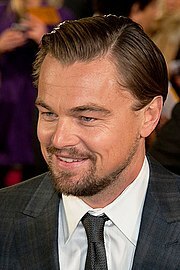 Wikimedia Commons has media related to Leonardo DiCaprio. This page was last changed on 7 March 2019, at 04:42.